Help Documents - Version 5 Custom ReportsHow do I include a "Who's Attending?" link on my registration website? First, a word about the privacy of your registrant's information. Usually, these reports should contain a limited amount of information. Be mindful of privacy issues. Typically, only company names are displayed. Registrant names may or may not be appreciated by everyone - you know your audience; what do they tolerate and expect in terms of personal privacy protection? The best rule of thumb: The less information, the better chance of not violating anyone's privacy. 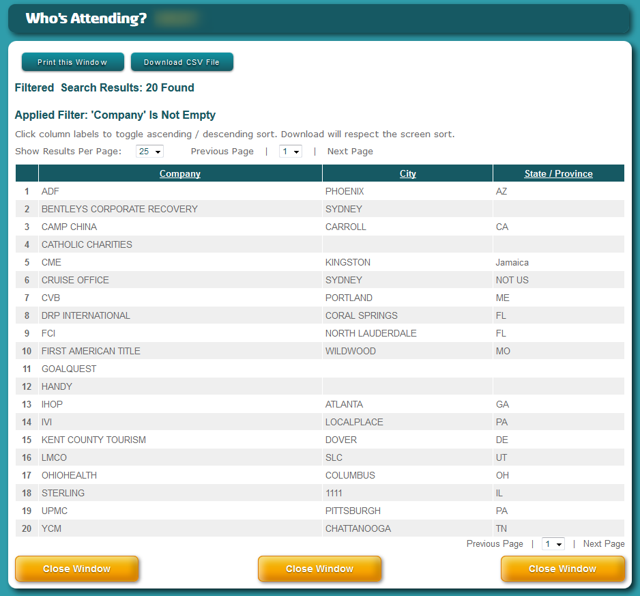 This example will create a report for just company names and city/state in the Who's Attending? report. 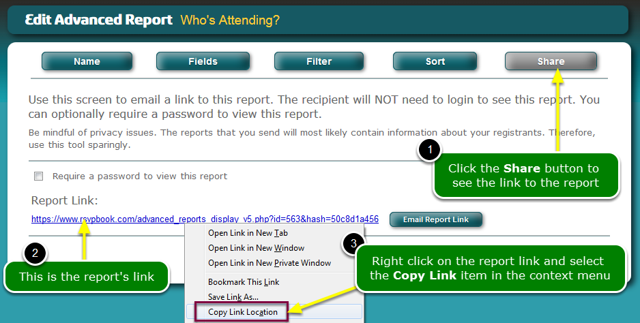 However, when you create your report, you can add any other information you want. Repeating: be mindful of the privacy of your registrants. What does the report look like when built with the Report Wizard? How do I use the Report Wizard? Zoom: What does the report look like when built with the Report Wizard? 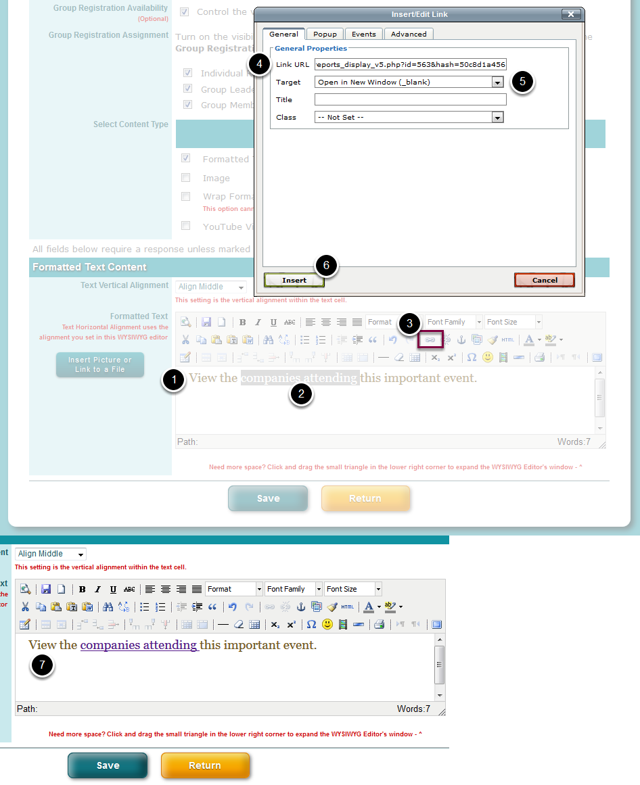 What does the report look like when built with the Advanced Report Wizard? What's different about the Advanced Report? Zoom: What does the report look like when built with the Advanced Report Wizard? Where is the report link? Whether you're using the Report Wizard or the Advanced Report Wizard, your report link is under the Share button in both wizards. Zoom: Where is the report link? How do I add this report to my registration website? Zoom: How do I add this report to my registration website? What does the registrant see? Clicking the "companies attending" link opens the report into a new window. This link used the Advanced Report version of the report. The report link could have been the Report Wizard version of the report. The reports will look different. 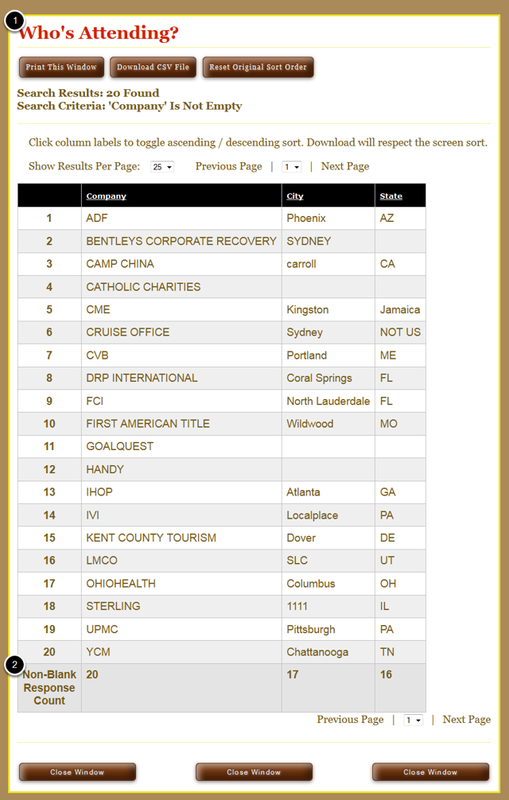 See the first 2 steps of this article to compare report appearances. Prev: How do I create an icon on my Windows desktop for my shared report? Next: Where do I access the Accommodations tool?